The global duty-free and travel retail market revenues likely to reach $112 billion by 2023, growing at a CAGR of approx. 8%. 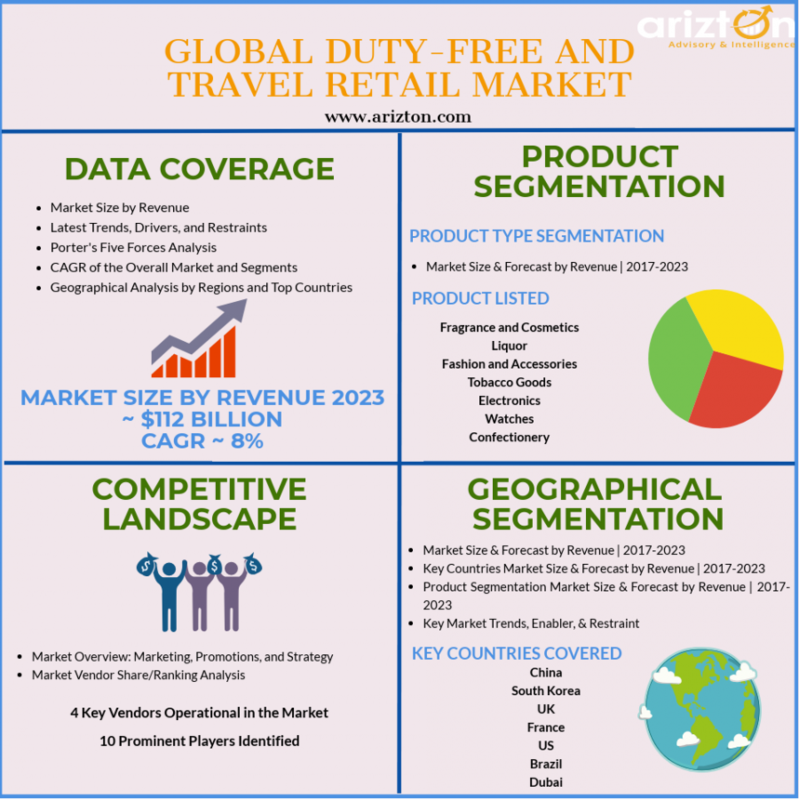 CHICAGO, IL, UNITED STATES, July 9, 2018 /EINPresswire.com/ -- Arizton’s recent market research report on the global duty-free and travel retail market identifies Dufry AG, Gebr. Heinemann, Lotte, and Lagardère Travel Retail Group as the leading vendors that are likely to dominate the market during the forecast period. This research report provides a detailed analysis of market segmentation by products (fragrance and cosmetics, liquor, fashion and accessories, tobacco goods, electronics, watches, and confectionery) and by geography (APAC, Europe, Americas, Middle East, and Africa). The growing demand for retail chains that offer luxury and premium brands of various products is augmenting the growth of the global duty-free and travel retail market. The growing number of international tourist, rising number of middle-class family, and increasing number of low-cost carrier (LCC) airlines will fuel the growth of the global market. The leading brands are opening exclusive stores for special products, promoting, and selling limited editions to increase their visibility and brand awareness in the global market. 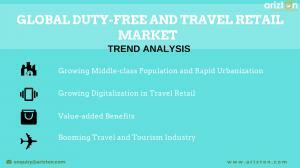 The global duty-free and travel retail market is estimated to generate revenues of around $112 billion by 2023, growing at a CAGR of approximately 8% during 2017-2023. For more information, Order a sample report here. The rising prosperity of the travel and tourism industry is one of the main factor augmenting the development of the global duty-free and travel retail market. The growth of the tourism and travel retail industry is creating jobs, driving exports, fueling retail business, and generating prosperity in the global market. According to World Travel & Tourism Council (WTTC), T&T (Travel and Tourism) accounted for around 10% of the global GDP and provided about 313 million jobs approximately 10% of the total employment, in 2017. The rise in global passenger traffic will contribute to the growing demand in the global market. The increase in international departures is directly impacting the growth of the global duty-free and travel retail market. Over the past two decades, the number of international travel departures across the globe has doubled from roughly 600 million in 1996 to 1.4 billion in 2016. Numerous travelers from emerging economies are traveling across the borders for the very first time, thus pumping billions of dollars of new growth into the travel economy and helping the industry outpace global GDP. Such increase in the number of passenger traveling will help vendors tap the opportunity in the global duty-free and travel retail market. The exponential proliferation of digital technology and integration of these solutions will propel the development of the global duty-free and travel retail market. The implementation of digital technology is driving marginal efficiency to an enabler of fundamental innovation and disruption in the global market. The leading companies are leveraging digital commerce and big data analytics to develop sophisticated retail strategies that will contribute to the growing revenues in the global duty-free and travel retail market. The rising popularity of virtual shopping platform is encouraging airlines to leverage these systems to gain a larger market share and reach a maximum number of consumers. The companies are using passengers or customer’s data activity using NFC, Wi-Fi, Bluetooth, and other related geo-technologies to drive consumers of the duty-free stores in the global market. With the use of digitalization, companies are personalizing connectivity using Bluetooth beacons and sending push notifications about the offers and new products available in the global market. These individualized services will boost sales in the global duty-free and travel retail market. Looking for more information. Download a sample before purchase. The addition of value-added benefits and services will propel the growth of the global duty-free and travel retail market during the forecast period. The retailers are improving their customer service, introducing loyalty programs, digitalizing of staff and store, and festivals are some of the primary factors attributing to the development of the global market. The development of the individuality and tailor-made offers is helping companies attract a large group of consumers in the global market. The use of digital signage technology to enhance them in-store communications and introduction of added benefits such as lounge access, free parking, and fast-track privilege will boost sales and revenues in the global duty-free and travel retail market over the next few years. Furthermore, the launch of the digital assistant hologram is a “virtual assistant”, which can interact with travelers in different languages and reinforces the stores’ marketing communications via video content that highlights specific promotional items is expected to transform the global market. The global duty-free and travel retail market by geography is segmented into APAC, Europe, Americas, Middle East, and Africa. Middle East dominated a portion of the market share in 2017, growing at a CAGR of approximately 9% during the forecast period. The increasing availability of superior infrastructure, high disposable income, growing tourism, and rise in the expat population are some of the primary factors driving the growth of this segment in the global market. Dubai is one of the most promising markets in the region and accounts for a very high market share. Products such as perfumes, liquor and tobacco, and cosmetics are some of the most popular items in the duty-free stores in the global market. The rapid opening of numerous duty-free and travel retail in the region will create lucrative opportunities for leading vendors operating in the global market. The duty-free and travel retailers are planning on their expansion strategy and are focusing on quality of products and services to attract a maximum number of consumers in the global duty-free and travel retail market. The use of targeted marketing campaigns and promotions coupled with excellent customer service will revolutionize the market. 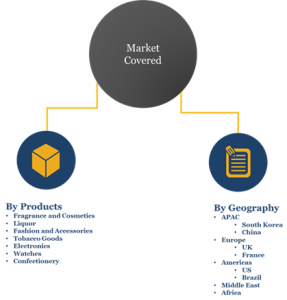 The product segment in the global duty-free and travel retail market is categorized into fragrance and cosmetics, liquor, fashion and accessories, tobacco goods, electronics, watches, and confectionery. Fashion and accessories segment occupied a considerable market share in 2017, growing at a CAGR of around 10% during the forecast period. The growing number of international passengers who are looking for new offers or new collection at the stores is augmenting the growth of this segment in the global market. The travel retailers are introducing innovative ideas and promotional methods in order to communicate with the customers and gain a larger share in the global market. The growing number of duty-free shops across the APAC regions especially in China, Japan, and South Korea will boost sales and revenues in the global market. APAC is the largest and fastest market for fashion and accessories in the duty-free and travel retail market. Africa is the second fastest region due to its increasing infrastructure, growing aviation industry, and rise in the influx of international tourist. The rising demand for premium brands will propel the growth of this segment in the global duty-free and travel retail market. The top retailers are offering numerous discounts offers and promotions to gain a larger market share in the global duty-free and travel retail market during the forecast period.